Mick Jagger and Keith Richards are not exactly fonts of spirituality, but in these lyrics they have a point. No one gets what we want. We don’t get the Church we want. We don’t get the family we want. And for us Redemptorists, we don’t get the Redemptorist Congregation or Province we want. I had the privilege to be elected (by default because I was the only student not attending school) to the Baltimore Province’s Chapter, held last month at our retreat house in New Jersey. It was an amazing experience to witness and participate in the Province’s governing process. Some discussions were heated with emotion and passion, and sometimes feelings were hurt. Yet, we would still celebrate Mass together and eat our meals together. In the end, some of the results of the Chapter disappointed us. Some of us who submitted legislative items had those items voted down. None of us, I expect, got exactly what we wanted, and yet we have what we have. Every day, we Redemptorists bring the Gospel to many people. We set out on our mission with certain expectations, and sometimes those expectations aren’t met. But we always get what we need because the Holy Spirit is in charge. I enjoyed my experience at the Chapter and I witnessed the Holy Spirit at work. Even if we didn’t get what we wanted, the Redemptorists of the Baltimore Province will continue spread the Gospel to all creation! 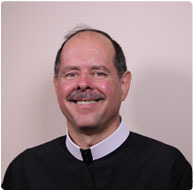 Deacon Jim McCabe is a Redemptorist preparing for ordination this summer. He is stationed at St. Martin of Tours Parish in Bethpage, NY. He will be writing a monthly blog about his ministry experiences.